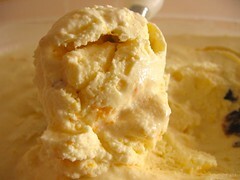 Orange-Date Ice Cream - Do You Know The Muffin Man? Notes: One look at the ingredient list shows this to be a rich full-fat ice cream: 2 cups each of 10% and 35% cream plus 6 egg yolks! The orange flavour comes from both zest — steeped in the cream plus more added afterwards — and fresh juice. Medjool dates are incredible (I've never had them before): plump and tender. The texture is a little watery: I think I would reduce the amount of cream next time to compensate for the cup of juice. Orange and date were a well-balanced combination of tart and sweet. A good, but not great, ice cream.